Original 8.5″ x 14″ concert poster for the Mabuhay Gardens San Francisco on March 16, 1977. Lovely near mint condition! 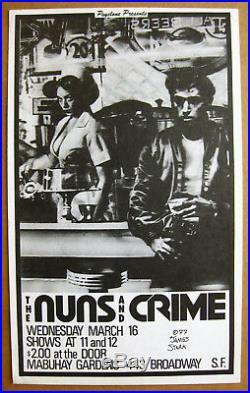 The item “The NUNS & CRIME 1977 Mabuhay Gardens CONCERT POSTER James Stark PUNK Minty” is in sale since Sunday, June 10, 2018. This item is in the category “Entertainment Memorabilia\Music Memorabilia\Rock & Pop\Artists C\Other Rock & Pop Artists C”. The seller is “slcd.com” and is located in THE WILD WILD WEST !!!. This item can be shipped worldwide.